Do you set aside certain casks intended for that expression? Or do you always have some spirit from each year’s run set aside in Oloroso? About how old are the whiskies chosen for the A’bunadh? How many casks are usually used for a bottling? Do you try to make each bottling a little different? “…there are some things I can share with you and some I can’t. We will [decant] a higher percentage than most distilleries into sherry casks so this allows us many more casks to consider when putting a batch of A’bunadh together. There are no specific casks set aside but it is the choice of our Master Blender in choosing the casks he feels have the correct profile for A’bunadh. So, there you have it. There is some randomness to the batches, and that makes them happy. Kind of begs the question as to why they don’t try to create variation if it makes them happy, but who knows, they may prefer synchronicity to predeterminism. I was hoping to get a range of age for the whiskies used, but the industry is really circling the wagons and working to get ‘age’ as a concept out of the minds of its consumers. NAS (No Age Statement) whiskies are common and I think we can expect more. Why do I care how old is my whisky? While on one hand I understand the criteria for a whisky should be how we experience taste, aroma and texture, there is more to drinking whisky than taste. Part of the allure of a fine whisky is heritage. Think of Formula 1 — it is more than a sporting series, it has a heritage of triumph, sorrow, hopes dashed with seconds to go. The courses bring back memories of battles between men who were larger than life, who lived how we would if we were faster, tougher, a bit better looking 🙂 There is a reason I watch Formula 1 beyond the racing, which is sometimes exciting, despite the modern gizmos. Another draw of a fine whisky is the mystique of age. To think that the Glenmorangie 18 given to me recently was distilled before my youngest son was born, and now he’s now taller, heavier, and undoubtedly smarter than I am, transforms that bottle from a mere whisky to a time machine. There are eighteen years of history, of weather and sunspots and neutrinos in that whisky. 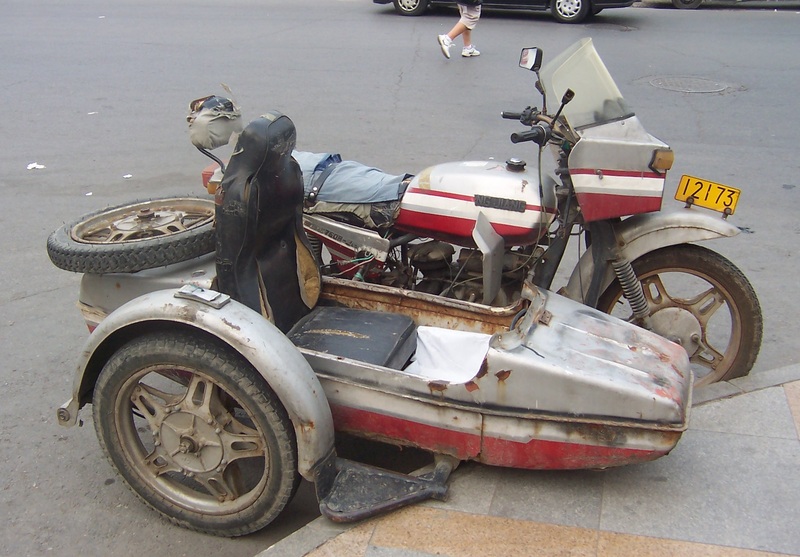 Beijing Motorbike, circa 2005. Is this cool or what? It’s an old saw: some things get better with age. Take this motorcycle, snapped on a backstreet in Beijing a decade ago. Go ahead, click on the photo, it’ll get bigger, you can see the details: the battle scars, the grime and dust from who knows how many miles trekking through that huge metropolis. Every dent tells a story, the scrapes and dings show us the grit and determination of the rider. When new, I would not have given such a utilitarian bike another glance. It was not styled so much as engineered. But now? This is one of my favorite photos from my Asia travels. Age matters. I’d like to hear more about my whiskies, because they are not just a drink, they are a transformation. 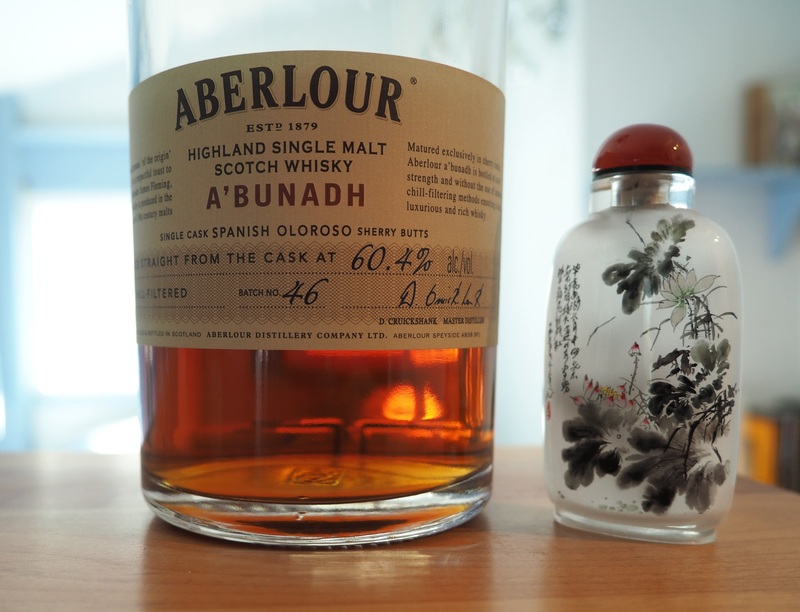 This entry was posted in Scotch-single malt, Whisky and tagged Aberlour, NAS, Scotch, Whisky. Bookmark the permalink.